Mario the carpenter and his brother, Luigi, are at it again! This time they're battling a barrage of crawling pests in a houseful of surprises. 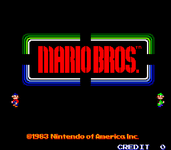 Help Mario brave the battle alone or team up with a friend for a two-brother battle. There were numerous ports of this original arcade game, and two for the Commodore 64. The first of these was never commercially released (see http://www.digitpress.com/library/interviews/interview_gregg_tavares.html).